Demi Lovato is up in all our faces promoting the release of her latest LP, Confident. 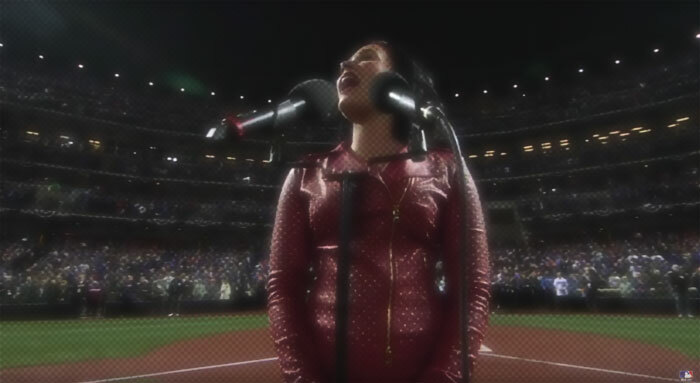 Her latest stop was at game 4 of the World Series- whatever that is- to sing the range-y national anthem, The Star-Spangled Banner. Now, for me, when I listen to any Diva sing this piece, I'm listening more for how they handle the lows than the highs. Why? Since most Divas make their living from being able to deliver the top notes, it's telling of their technique how they manage their less utilised registers. But how did Demi do? She was okay. Sounds harsh, right? Well, after hearing so many renditions while making the Duelling Diva post Re: The Star-Spangled Banner, this came off average in comparison. First of all, kudos to her for singing a capella, because that's not easy. However, the voice sounded dry, forced and stiff. The lows were also lacking projection, which, like I said, is one of the parts I listen most intently to. Having heard Demi sound better than this, I'll chalk this one up to a dodgy vocal day. Or maybe the problem is with me. Just read a Youtube comment likening this performance to Whitney Houston's iconic rendition! That does leave me thinking maybe I'm the one having a bad hearing day...I'll leave it to you lot to bring some clarity in the comments.